Time-measuring instruments have marked significant epochs in history for millennia. Six thousand years ago, the shadows cast by obelisks in the Sumerian city of Ur revealed the passage of the sun; two thousand years ago, astronomers in ancient Greece used the Antikythera mechanism to calculate the positions of the sun, moon and planets in the heavens; and in the 18th century, John Harrison’s H4 clock enabled safe and accurate navigation by sea. URWERK now endows the 21st century with its own epoch-defining time – or Zeit in German – measuring instrument: The UR-1001 Zeit Device. In our fast-paced lives we often describe time as 'fleeting' and our timepieces reflect this perception by measuring relatively short intervals – by geological or astronomical scales – i.e. seconds, minutes and hours. A few watches take a longer view and track days, months and years, some even leap years. But rarely do timepieces do justice to a universe measured in billions of years – as a true Zeit Device should. The UR-1001 is a true Zeit Device: It is a grand über complication both measuring and quantifying the era in its entirety, from a solitary second to an astronomical millennia. 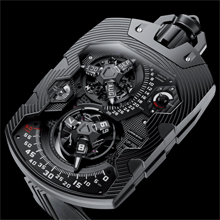 Exuding force from a case seemingly carved from a block of solid metal, the UR-1001 marks the passage of time in seconds, minutes, hours, day/night, date, month, years, 100 years and all of the way to a monumental 1,000 years! The Zeit Device houses a constellation of indications, including orbiting satellites and a comet-like flying retrograde. 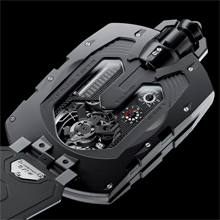 Dials, springs, satellites, carrousels, retrograde spiral spring were all manufactured in-house by URWERK, as were most of the components in the Zeit Device's complications and indications. The AlTiN UR-1001 is a limited edition of 8 pieces in AlTiN treated steel with titanium elements. Hour Satellite Complication. The Hour Satellite Complication of the Zeit Device is a ‘flying’ design in that there is no top bridge supporting the carrousel. The mechanism requires a bottom support only, which allows maximum appreciation of the satellite hour and retrograde minute complications. The complication comprises a rotating central carrousel supporting three hour satellites, each cubic satellite marked with four hour numbers on their four faces. As the carrousel turns, the satellites not telling the time rotate on their vertical axis so that their top number has the new hour ready to replace the old. Hours and minutes are able to be set backwards without affecting the calendar functions. Retrograde Minute Hand. The Retrograde Minute Hand is fixed to a sprung ring around the circumference of the satellite complication. This ring is pushed along a guide rail by the hour satellite. A swan’s neck spring on each arm of the carrousel engages two coaxial star-cams that slide along the guide rail carrying the minute hand. When the minute hand gets to the end of the rail at 60 minutes, the star-cams trip over to release the minute hand, which springs back to zero at the start of the scale where it rendezvous with the next satellite hour. A small bar of platinum on the sprung ring acts as a counterweight to the minute hand pointer. A safety device ensures that the minute hand cannot rotate past 63 minutes, even in case of a shock. Day Night and Power Reserve Indicator. The Day/Night indicator is a rotating disc marked with Black Super-LumiNova for the night, white brushed-ruthenium for day and a striped mix for dusk/dawn. While useful in its own right, the Day/Night indicator comes into its own when setting the calendar mechanism to ensure that the date changes at midnight rather than midday. The Power Reserve indicator monitors the amount of power in the mainspring up to 39 hours and features a red warning zone to remind the owner when the Zeit Device needs refuelling. Revolving Satellite Calendar. The Revolving Satellite Calendar is an original – both technically and graphically – calendar complication completely developed in-house by URWERK. Visually it is in the same family as the hour satellite complication, with months and date replacing hours and retrograde minutes. However, whereas the hours rotate across the minutes with unchanging 60-minute regularity, the month automatically adjusts the last date on the calendar complication according to whether it has 30 or 31 days. Turning the UR-1001 over and flipping over the protective cover reveals an alternative universe of longer timescale indications to those on the front. The dominating feature through the display back is the underneath of the hour satellite complication and retrograde minute mechanism, its dark surface set off by bright ruby bearings. The “Oil Change”, 100-year and 1000-year are long-term indications lying under a protective cover on the back of the Zeit Device and are driven by the operation of the movement. “Oil Change” indicator. The shortest time interval measured on the back is the 5-year “Oil Change” indicator at centre right, which alerts the user when a service is due after three years when the dial changes from white (years one to three) to red (years three to five). This is counter is reset to zero when the timepiece is serviced. 100-year indicator. The 100-year indicator advances in 5-year increments and acts like the odometer of a car. Where a car’s odometer keeps track of the total distance number at vehicle has driven, the 100-year and 1000-year indicators of the UR-1001 register the total running time of the movement. 1000-year indicator. When the hand reaches the 100-year mark, the small pointer at the bottom of the 1000-year indicator on the left takes a small – small for the Zeit Device, but a giant leap for mankind – 100-year step upwards on its imperceptibly slow, but deliberate journey to a new millennium. The case of the UR-1001 is in AlTiN coated stainless steel. AlTiN – Aluminium Titanium Nitride – is an industrial surface treatment originally developed to reduce the wear of machine cutting tools. The very properties that make AlTiN suitable for industrial applications, e.g. increased oxidation resistance and hardness, coupled with its semi-matte black colour make it an ideal high-tech coating to protect the Zeit Device. The fine finishing and decoration throughout the case, dials and components of the Zeit Device are a harmonious blend of the contemporary and the traditional, echoing URWERK’s ethos of 21st century watchmaking based on a solid foundation of the very best in traditional horology. Circular lines engraved into the top of the case give hint to the fact that the form of the Zeit Device’s case is actually a circle with cut sides. Clous de Paris guilloche on the dial provides both a rich texture and a pleasing contrast with the flat surfaces on the indications. The satellites and their hands feature diamond-cut bevels that reflect light during the day, while flush embedded white Super-LumiNova ensures legible reading of the time at night. Clous de Paris guilloche surfaces continue on the back of the timepiece and in a tip of the hat to URWERK’s home,   Geneva waves (Côtes de Genève) are engraved on sections of the bridge supporting the base of the Hour Satellite Complication. 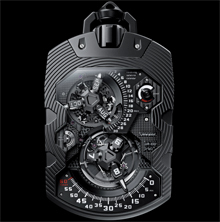 URWERK is one of a very few watch brands – perhaps the only – making extensive use of ARCAP is their timepieces. ARCAP alloys are a proprietary group of alloys that do not contain iron and so are non magnetic. They have very high tensile strength and they are resistant to oxidation – unlike the commonly used brass that has to be plated – chemical corrosion, low temperatures and are stable under temperature changes. And compared to brass, ARCAP is more stable when machined and does not retain tension, which makes it able to be machined to higher precision. ARCAP’s advantages do not come free of charge and it wears machine tools out at a 5X higher rate than brass. In the UR-1001, the mainplate, baseplate, carrousels, satellites, dials, bridges, retrograde spiral spring and retrograde u-springs are all in ARCAP. The combined automatic winder and display case of the Zeit Device is in polished, solid walnut with buffalo leather lining. The case can sit on a desk with the timepiece securely held (push-fit) in a vertical position with the dial side in full view. Every 10 or 15 minutes – the interval is adjustable according to whether the timepiece requires fast winding or maintaining winding – the Zeit Device is rotated 185° and slowly oscillates to rest, causing a winding rotor to charge the mainspring. Keeping the Zeit Device wound in this way minimises the necessity of having to reset the calendar functions after the movement has stopped. The AlTiN UR-1001 Zeit Device is a limited edition of 8 pieces in AlTiN treated steel with titanium elements.